Up until this point, all of the promo models I have written about have been plastic but there are a segment of collectors who concentrate those made of metal, most of them banks. Produced mostly in the 40’s by Banthrico Company in Chicago, IL. Banthrico models painted in authentic Big Three colors and used as “paint chips” so dealers could gauge the upcoming colors on real models. 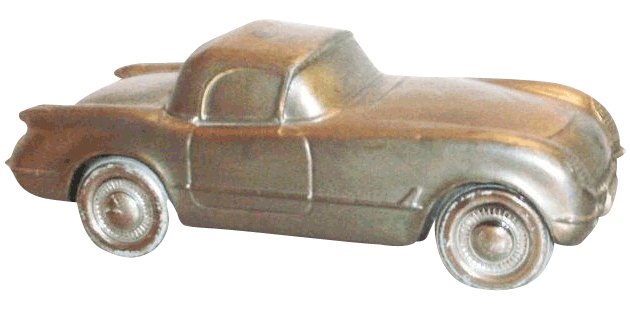 These primitive promotionals included Buicks, Cadillacs, Lincolns, Packards, DeSotos, Chryslers, Dodges, Ramblers and, of course, the more common Chevrolets and Fords. Today these cars are sought after, and in mint condition can garner several hundred dollars. I have two examples to share with you both near and dear to my heart this 49 Nash and a 50 Chevy. 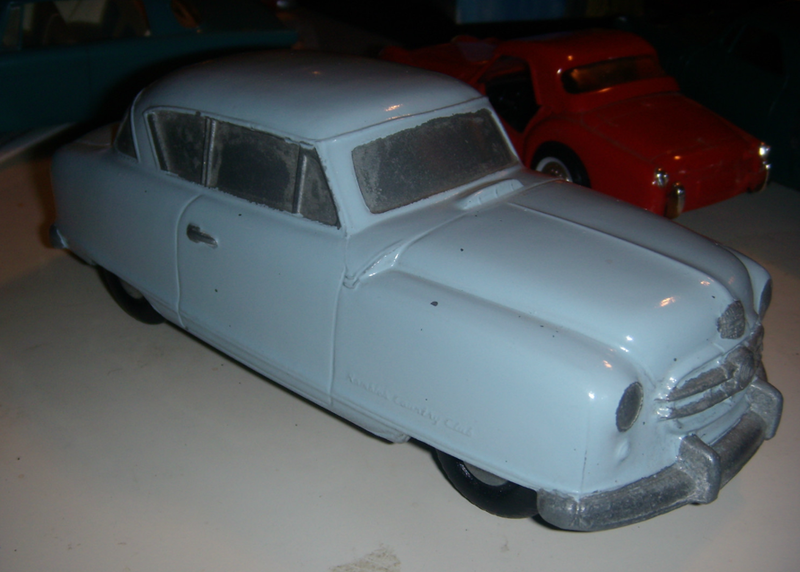 This Nash pictured was available only to the Nash dealer as a bonus for ordering a car. Original dealer cost for the carton of 12 promos was $12.50. What a deal. Think about it if you had bought a case or two. Bingo, lots of cash. The Nash Rambler was produced by the Nash Motors division of Nash-Kelvinator Corporation from 1950 to 1954. 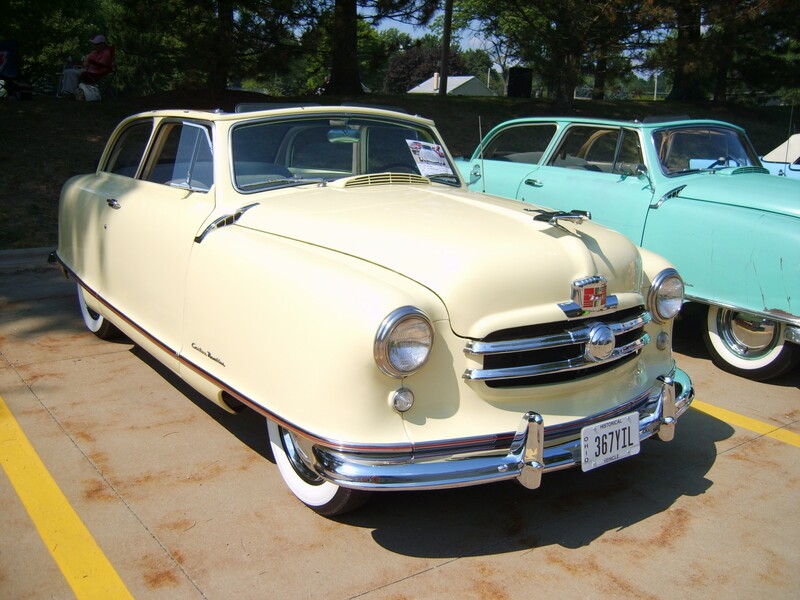 On May 1, 1954, Nash-Kelvinator merged with the Hudson Motor Car Company to form American Motors Corporation (AMC). The Nash Rambler was then built by AMC in Kenosha, Wisconsin through 1955. The Nash Rambler established a new segment in the automobile market and is widely acknowledged to be the first successful modern American compact car. 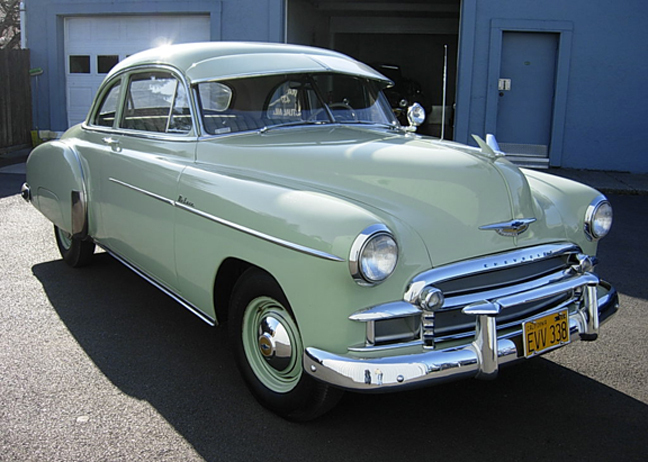 This other example, a 1950 Chevrolet 2 door and also close to my heart as my grandfather had one, maybe a Skyline Custom. I think it was that drab green like this one I found. They were huge sellers for Chevy, in the millions. 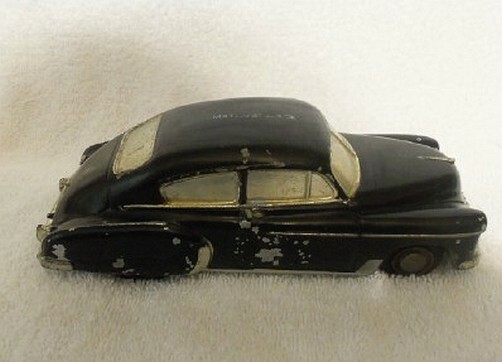 This model is pot metal and has rubber tires, it has some paint missing but overall good. These banks can go anywhere from$50 to several hundred dollars depending on the shape they are in. Since I have lots of the plastic promo models, I might move into the bank cars. For the good ones, it is certainly something you can bank on giving you a return. Sorry, had to throw that pun in there.